Warm Tip : Please be reminded that due lighting effects, monitor's brightness/contrast settings etc, there could be some slight differences in the colour tone of the website's photo and the actual item. Thanks for your understanding and happy purchase! Quantity : Set of 100. Material: stainless steel, durable and not rust. Perfect for hanging photos, drapes, and many other home uses! SIZE---Stainless Steel Curtain Clips total length (hook+clip): 3.3cm/1.3inch;Clip lenth: 1.8cm/0.71inch;Clip Width:0.9cm/0.35inch. 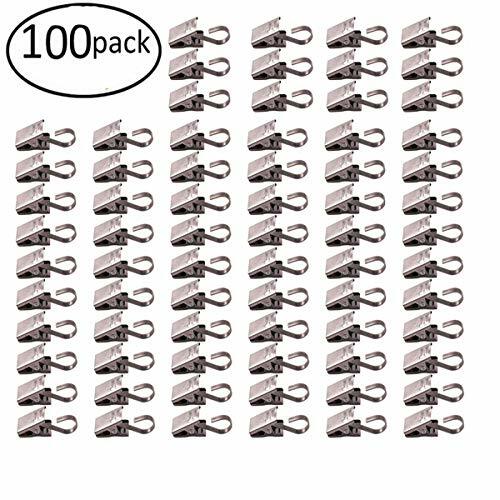 Package includes - The set includes 100 easy-to-install practical black metal hook clips. Various uses--Perfect for hanging shower curtains,photos, drapes, cloth, bags , photo clips, shower curtain rings and for laundry.Also can be used for organize other stuffs.Save more space for you. Metal hook clips more durable than wooden clothespins that can break easily, these metal clothespins will stand up as clothes hangers time after time. Various uses like photo clips, shower curtain rings and for laundry. If you have any questions about this product by Ruilove, contact us by completing and submitting the form below. If you are looking for a specif part number, please include it with your message.